If we want to be able to install a Minecraft hacked client, we firstneed to establish some basics: The install folder of Minecraft is hidden by default on most Windows operating systems, so you will need to go into your control panel, (appearance and personalization), folder option, view ad there you need to set your system to “Show hidden files, folder and drives” in order to make it even possible to find the Minecraft folder. After you have made all hidden folders on your PC visible, you can now start the quest to find your Minecraft folder. On my Windows 8 Rig the path is [Windows Drive]/Users/MyUsername/AppData/Roaming/.minecraft. If you are using something like XP or Vista, there might be Application Data instead of AppData and there might not be a “Roaming” directory. It has been quite a long time that I used the earlier Windows versions, but you will find the Minecraft folder in your Application Data and that is always in your Users/YourName folder. Whenever you are downloading a legit Minecraft client, you will get 2 files: One .jar file and one .json file (as of 2014). Now in order to install this hacked client, you will have to create a folder (if there isn’t already one) and put the 2 files in that folder. Now you have to make sure that the folder and the 2 files within have the exact same name. So for example my folder is called “DatHack”, then my files have to be called “DatHack.jar” and “DatHack.json”. If the file names do not match, the hack will not work. Next you open the .json file using your Text Editor (Notepad) and the first line you see should specify the clients ID: "id": "1.6.4" Now you need to change the ID value to whatever you choose to be your client name and that you used as your file and folder name. So in my example, I would rewrite into: "id": "DatHack “, then save the file and you are almost done. Now start your Minecraft Laucncher by starting the Minecraft.exe and go to “Edit Profie”, then under “Use version” choodse your hacked client name (in my case: DatHack), then Save your Profile and start the game by pressing “Play”. – There you go, you now are using a hacked client to play Minecraft. The most popular way of cheating in the Minecraft single and multiplayer are hacked clients. These are basically versions of Minecraft that have been edited (aka hacked). Most popular are hacked clients with in game menus to activate all the included options. There are literally hundreds of different cheating options that can be included in a client. The most popular options are flying and wall hacks, allowing you to fly around and pass through walls. 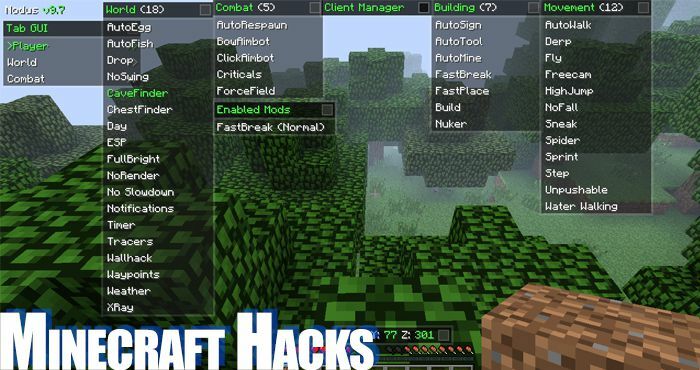 Hacked clients are most useful in survival mode and in multiplayer games, since you already are quite overpowered in the creative mode, using a hacked client there is a bit less useful. In creative mode and online multiplayer servers however, hacks game get you a real advantage over the environment and your fellow Minecraft players. Editing your saved game (world / biome) is an effective way to cheat in the single-player mode of Minecraft. Savegame editors allow you to edit literally everything in your single-player world: Your inventory, your items, your experience, level, the environment, the monsters, the time and everything else. This allows you to insert items into your inventory or chests that you otherwise would be unable to get, such as lava and water sources. Savegame editors cannot be used to cheat in multiplayer, unless you are actually the host of the server. Mods can also be used to cheat in the single-player of Minecraft. Most popular are mods that can give you items in survival mode, but there are several other mods that can give you an advantage. Mods can also add new items to the game that are as overpowered as the mod developer wants them to be: Swords that can one shot everything or even cause explosions on hit, multiplying creepers that will make your pc crash, monster spawn mods and basically everything you can imagine and people have time to code. – These are the funniest cheats, especially if they are installed on a multiplayer server, they can cause quite a party.